ow it's time to add some citrus wonders to your juice and life. Adding lemons & limes to your daily regimen is another one of the best things that you can do to help alkalize your body, and drive out toxins in order to detoxify your body. So make sure to add 1 lemon and 1 lime to your juice everyday! 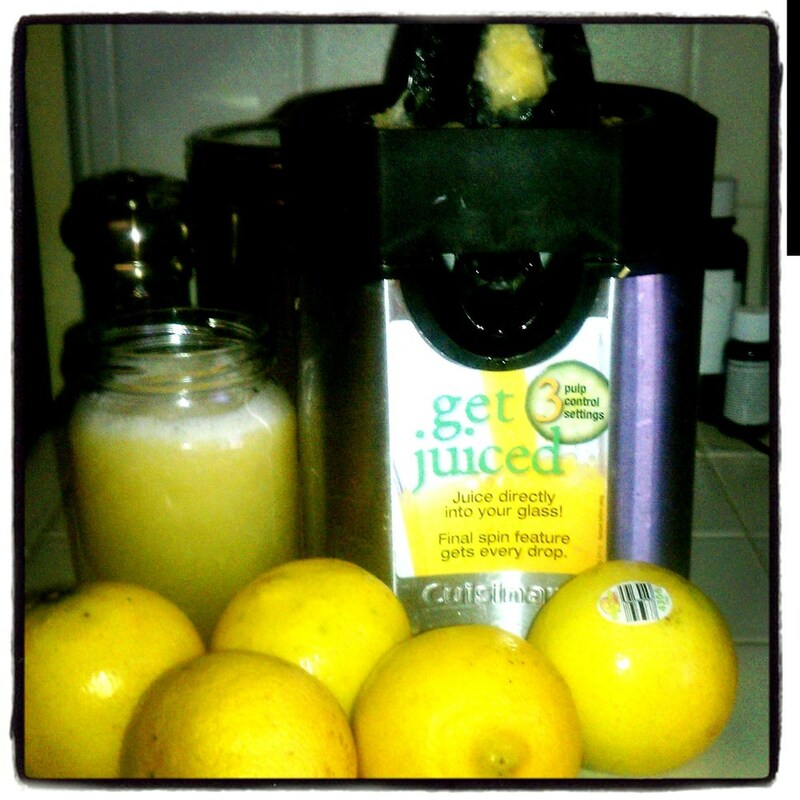 Lemons & Limes are 2 things that I literally include in EVERY JUICE, EVERYDAY. I started off using a Lemon Squeezer like that one pictured here, and so I would cut 1 lemon and 1 lime in half, and then use this squeezer to extract as much of the juice as possible. I now decided to buy a separate small Citrus Juicer like the one below, in order to maximize the squeezing! They also will literally improve the taste of ANY combination of veggies into something that you will not want to stop drinking! As a test, after you make your juice, take a shot of it by itself. Then squeeze in the lemon & lime either with your citrus squeezer or with your hand for that matter, and then taste the difference. You will notice a dramatic taste change, and this has been one of the keys to helping me juice every single day, as the juices simple just taste good! The health benefits of lemons & limes are plentiful, the most surprising being the ability of these fruits to stop the cell division that often leads to many forms of cancer. But lemons and limes both have antioxidant properties—thanks to the vitamin C—that can stop free radicals in their tracks. This can lead to less inflammation and help fight diseases like osteoarthritis, arthritis and rheumatoid arthritis. What’s more is that the vitamin C provides another health benefit of lemons & limes; reduced risk of diabetic heart disease and atherosclerosis, as well as reducing the risk of death from diseases like heart disease, cancer and stroke. The health benefits of lemons & limes also include weight loss; however lemons and limes alone won’t get the job done. However what will get the job done is topping your favorite leafy greens juice or other fat burning foods with lemon or lime for a fat burning bonus! 1) Lemon/lime water helps purify and stimulate the liver. Lemon/lime water liquefies bile while inhibiting excess bile flow. 2) Lemon/lime water aids digestion. It's atomic composition is similar to saliva and the hydrochloric acid of digestive juices. 3) The liver produces more enzymes from lemon/lime water than any other food, according to A.F. Beddoe, author of Biological Ionization as Applied to Human Nutrition. 4) The lemon/lime water helps bowels eliminate naturally and easily. 5) Lemons and limes are high in potassium. Potassium is an important mineral that works with sodium for smooth electrical transmission in the brain and nervous system. Depression, anxiety, fogginess, and forgetfulness can often be traced to low potassium blood levels. That same nervous system needs potassium to assure steady signals to the heart. So your heart health is improved from the lemon water's potassium. 6) Calcium and magnesium are plentiful in good ratio to each other in lemon/lime water. Magnesium is important for heart health and calcium prevents rickets. 7) Lemon/lime water can help lower blood pressure. 8) Lemon/lime water has an alkalizing effect in the body as it is buffered. Even if you drink it just before any meal, it will help your body maintain a higher pH than if you didn't drink it. The higher or more alkaline your pH, the more your inner terrain is resistant to minor and major disease. 9) Helps dilute uric acid, which if it accumulates it creates arthritic pain or gout. 10) Helps reduce phlegm in the body.